^ Stedman's medical Dictionary (وەشانی 28th). Philadelphia: Lippincott Williams & Wilkins. 2006. 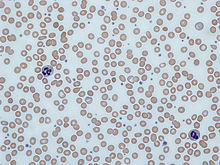 پەڕە Anemia. ISBN 978-0-7817-3390-8. ^ Tayles N (September 1996). "Anemia, genetic diseases, and malaria in prehistoric mainland Southeast Asia". American Journal of Physical Anthropology. 101 (1): 11–27. PMID 8876811. doi:10.1002/(SICI)1096-8644(199609)101:1<11::AID-AJPA2>3.0.CO;2-G.
ئەم پەڕەیە دواجار لە ‏٢٢:٠٠ی ‏٢٨ی کانوونی یەکەمی ٢٠١٨ نوێ کراوەتەوە.